Last night we headed to the movies for the special one night showing of the movie Hood to Coast. 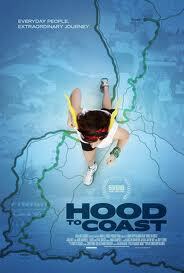 The documentary is about the annual Hood to Coast relay race in Oregon. The event is a 197 mile relay race from Oregon's Mt. Hood to the beach in Seaside, Oregon. Teams consist of 12 runners who each run 3 legs varying in distance from 3 to 8 miles. Hood to Coast is the largest relay in the country with 1000 teams each year. HTC was started by Bob Foote in 1982 and has been run every year since. The movie focuses on 4 teams and their journeys to conquer the race. From a team of beginning runners to a team of veterans who run the race every year. A team of women over 50 whose one member collapsed and nearly died doing the race the year prior and a team who runs in memory of a family member and friend who suddenly died the prior year. The movie is full of emotion, humor and inspiration. The movie is great and I recommend everyone see it. These stories had me wanting to register for HTC as soon as I could get home. If you live in the bay area and don't want to have to head to Oregon there are similar relays close to home. "The Relay" happens at the beginning of every May and runs from Calistoga to Santa Cruz. The Ragnar relay will put on its first Nor Cal race in September running from SF to Calistoga. Now I'm off to find some teammates.